Jinzhou is the central city of west part of Liaoning Province along the Bohai Bay, located in the northeast China. It only takes a drive of 4 and a half hour to reach Beijing. Jinzhou is an ancient town with a thousand-year history. Green mountains and blue water add more glamour to this beautiful city. The natural scenery and valuable historic heritage make Jinzhou a hot tourist city of Liaoning Province. It has a geographically advantageous location with a coast-line of some 100 kilometers. Jinzhou Harbor is China's first open trade port in the northeast part. It is a flourishing commercial city and modern international port. It is the communication hub linking the northeast and north China. Jinzhou comprises of 5 universities and colleges, 22 scientific research institutes with 100 thousand professional staffs, which ranked the third place in Liaoning Province. China's first female riot police force was set up by the Public Security Bureau in Jinzhou city in 2003. Jinzhou is a city in Liaoning Province, which is one of the 3 provinces that makes up `Dongbei` or the north-east region of China. There are 3,000,000 people living in Jinzhou prefecture. 770,000 of them live in urban areas, but there are several smaller towns around Jinzhou city proper. 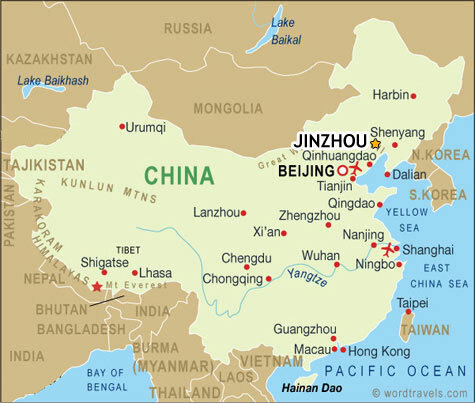 Jinzhou is about five hours east of Beijing by train. It is another 5 hours or so to Dalian, a fast-developing city, also called the `Hong Kong of the north`. Shenyang, the provincial capital, is a little more than 2 hours away. Shanhaiguan, where the Great Wall of China meets the sea, is about an hour and a half to the west. Jinzhou City lies half an hour away from the seaside and Bijiashan (an island dotted with temples in the Bohai Gulf that can be reached on foot, once the tide pulls away). Apart from Bijiashan, Jiznhou doesn`t have that many tourist attractions, which makes it a place where real Chinese culture still exists and it is often referred to by many expats living here as `the real China`. There is plenty of green space with wide coverage of trees. The reservoir that forms one of the borders of town is planted with weeping willows and has a beautiful promenade and park. There are a number of well-groomed public parks where the city's residents gather until late evening. There are mountains for hiking nearby. Downtown is busy. The sidewalks are full of window-shoppers. Stores blare advertisements and techno to draw shoppers in. There are vendors hawking their wares. Buses, cars, motorcycles, scooters, pedicabs, bicycles and pedestrians perform a chaotic ballet at every intersection.